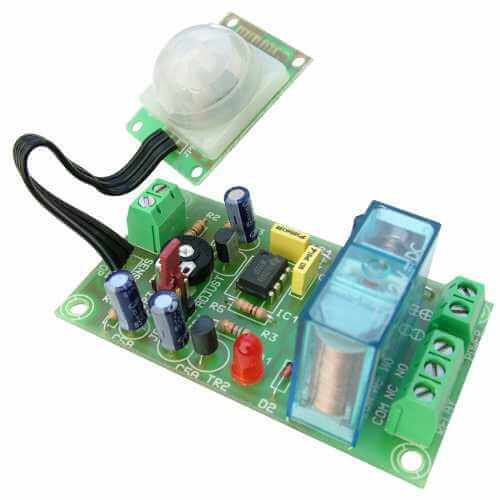 PIR sensor movement detector with mains rated relay output that actives when movement is detected. The output can be set to operate in Timer mode (user adjustable timeout from 1 second to 5 minutes) or Latching mode with manual reset. The detection range is up to 5 metres. The board has a Reset input that deactivates and disables the output for as long as it remains closed (Timer and Latching operating modes). It is designed to accept a simple external contact closure e.g. push switch (not included). When the output is activated in Toggle Mode it will remain on until the board is reset or power is removed. In Timer mode, the output will timeout from when movement was first detected, However, the output will instantly retrigger if movement is detected at timeout. An LED indicates the relay status. The board is reverse polarity protected. Screw terminal blocks for all connections. Can be installed into a DIN-RAIL Ref. C-7562. Note: Maximum supply voltage is 12Vdc. Do not use with an unregulated power supply or battery capable of exceeding 12V without a voltage regulator like CLB06. Current Consumption 8mA Min, 75mA max.